TBHC's Division of Hemodialysis Services operates a service in the hospital as well as the outpatient Rockwell Chronic Dialysis Center. 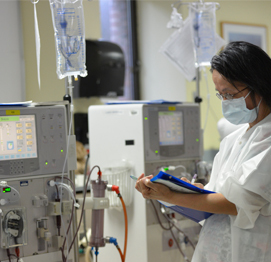 Our services are dedicated to improving health outcomes for patients with renal diseases. Dialysis services are provided for patients in need of acute, chronic or CAPD/CCPD (home peritoneal dialysis) services. The Rockwell Chronic Dialysis Center has been recognized by the Centers for Medicare and Medicaid Services (CMS) with a 5-Star Rating for 2017. This marks six years in a row that the Rockwell Center has been recognized with the highest possible rating from CMS. This rating award makes TBHC's Center one of the leading dialysis facilities in the United States. Our team of doctors, nurses, technicians, nutritionists and social workers work together to provide the best care possible. Each dialysis station has a fully reclining chair and personal TV, with cable and DVD available. Chronic Hemodialysis Services are provided six days per week, Monday through Saturday.